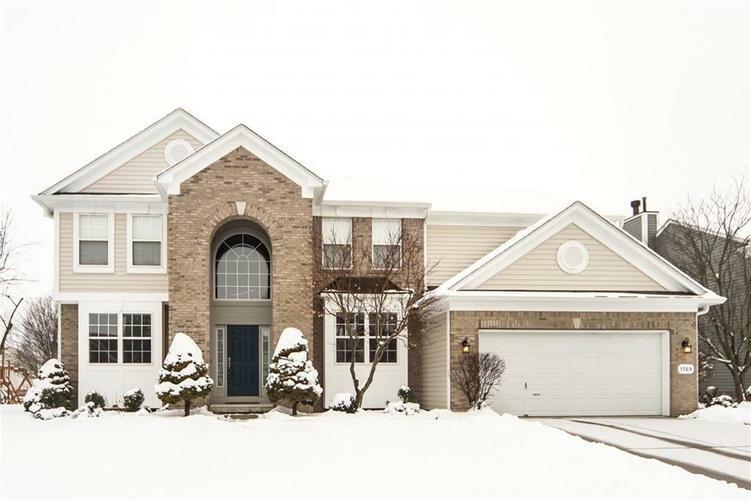 Spacious 5 bedroom home in popular Saddle Creek features dramatic 2-sty entry, 9 ft. ceilings, open floor plan, updated kitchen w/breakfast bar, large breakfast room, some kitchen SS appliances, Cab crown & granite! Newer upper level & basement carpet! Family room w/gas fireplace. Main level den/office & formal dining room! Newer hardwoods throughout main level. Upper level boasts sought after 5 bedrooms, master suite with vaulted ceiling, walk in closet, garden tub & separate shower, both master & hall bath w/newer LVT flooring & vanities. Finished basement! Dimensional roof & gutters-2016! Rear deck overlooks mature trees for privacy & walking trail. Awesome neighborhood amenities...trail, pool, playground, tennis & basketball! Directions:From Ditch Rd. head west on 141st St. Turn right onto Esprit Dr. and follow around to home on the left.